One TD says it means councils will be “doing the dirty work” of Irish Water. THOUSANDS OF COUNCIL tenants throughout Ireland could have unpaid water charges taken from their rent, according to a departmental document raised in the Dáil today. 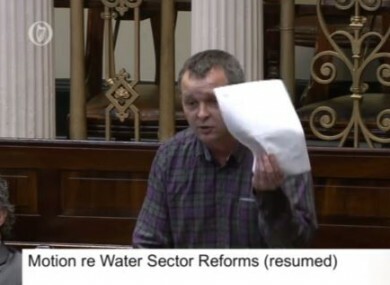 The provision was highlighted in the Dáil this afternoon by People Before Profit TD Richard Boyd-Barrett, who said it amounted to local councils “doing the dirty work” of Irish Water. In the particular case of local authority tenants, where deposit arrangements do not apply, where a customer is in arrears for more than 12 months, and a late payment fee has accrued, Irish Water – having first provided the customer with the opportunity to pay the arrears, or enter into a payment plan – will advise the local authority concerned of the amount of arrears, and the local authority will be required by law, to recover the amount outstanding over a 12-month period. So the councils are going to be doing the dirty work of Irish Water, and taking Irish Water’s arrears out of council tenants’ rent. The Department of the Environment this afternoon denied that the provision in question was a “directive to local authorities,” but the Dún Laoghaire TD said this was “semantics”. “This is what is on the Environment website and South Dublin County Council had it,” he told TheJournal.ie. So what do you call that? If that’s where South Dublin County Council is taking its guidance from in terms of this, is that not a directive? That’s what they’re being told to do. Email “Council tenants could have water charges taken from their rent by local authorities”. Feedback on “Council tenants could have water charges taken from their rent by local authorities”.